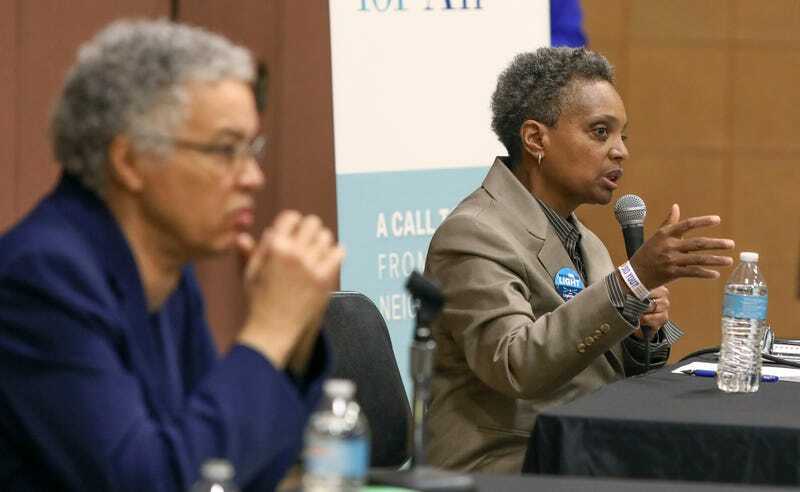 Chicago mayoral hopefuls Toni Preckwinkle and Lori Lightfoot at a March 2019 forum. No matter which way the wind blows in Chicago today, voters will make history by electing a black woman mayor. Lori Lightfoot, a former federal prosecutor, and Toni Preckwinkle, president of the Cook County Board, face off at the polls in a runoff after being the top two finishers in a contest of 14 contenders back in February. But the outcome may be lit in more ways than one. The race has been so nasty, with vicious barbs thrown from both sides, that the Revs. Al Sharpton and Jesse Jackson had the pair promise to hold a “unity” conference Wednesday, the day after the vote, no matter who wins. Chicago will become the biggest U.S. city to elect a black woman as mayor, according to the New York Times. If Lightfoot wins, Chicago will also be the largest city with an openly LGBTQ mayor. Despite the history in the making, in many ways, the race had many of the markings of old-school politics, with low blows and sharp barbs. Lightfoot, a former federal prosecutor and an appointee of outgoing Mayor Rahm Emanuel, who chose not to seek a third term, likened Preckwinkle to a “cockroach” in an attack on her ethics. In the lead-up to the first round of voting, Lightfoot compared Preckwinkle and three other candidates with personal and political ties to a powerful City Council member who was charged in January with attempted extortion to vermin for trying to distance themselves from the tarnished politician. Meanwhile, prominent supporters of Preckwinkle, including Chance the Rapper and former Black Panther and current Rep. Bobby Rush (D-Ill.), have urged voters not to trust Lightfoot, citing her work on Chicago police oversight boards and the fact that she comes from Chicago’s predominantly white North Side, rather than the predominantly black South and West sides of the city. Only time — and voter turnout — will tell which of these women will make the historic leap to the mayor’s office.